Destruction is always fun and entertaining, and with Wikileaks Defender from Super Boise, you have a new target: top secret government files that are about to be leaked to the public by Wikileaks, a controversial website infamous for releasing classified government documents to the public. In this game, you are a mustachioed, aviator-wearing TSA agent wielding a security wand and blasting away at these top secret files before they can be uploaded to the ‘Net. Game play is relatively simple. Fireball top secret files as they come at you with the swipe of your finger. If any the files manage to get past your little TSA man, you lose a life; lose three lives and the game is over. Large files move slow while smaller files “upload” much quicker. The longer you’re in the game, the faster the files zoom towards you–and in increasing numbers. There are no additional challenges or progressing levels, just swipe and destroy. You can score combos if you knock out more than two files at a time and this adds to your overall score, which can then be uploaded and shared with your friends through Twitter, email, and text. After scoring a certain number of points or surviving a certain length of time in the game, you can obtain one of fifteen different Achievement badges. The graphics are rather basic but entertaining, without being too distracting. While attempting to survive under the onslaught of government paperwork, pictures of domestic and foreign bureaucrats flash in the background on the screen of a large laptop your little TSA man is standing in front of. Using a combination of martial arts and robot moves, the TSA man seems to dance to the accompanying disco-tech music while ensuring national security. Lights glow and laser-like sounds ring out as blasts are fired from the security wand towards the approaching files. Wikileaks Defender is a fun game with no lag, but lacks real substance with no leveling up, side games, or interesting prizes. Although the Achievement badges are nice, it would be fun if the security wand could be upgraded for something more interesting. 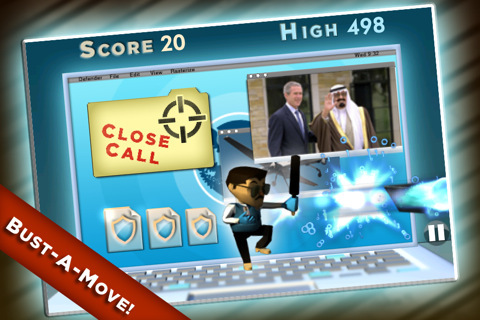 Fans of Fruit Ninja might enjoy this game but those who require more from their game play might find Wikileaks Defender too simple to hold their attention for long. Sample the free version of Wikileaks Defender on your iPhone. 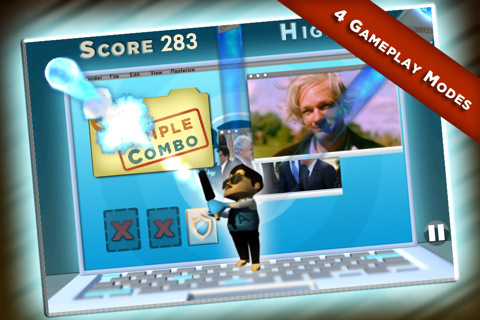 AppSafari review of Wikileaks Defender was written by Julie Guan on January 29th, 2011 and categorized under Action, App Store, Fun, Games, Line Drawing. Page viewed 4617 times, 2 so far today. Need help on using these apps? Please read the Help Page.